Do you think mobile app development needs API support for flexible, light weight and robust application development? If you don`t have any idea about it then you are at the right place to be aware about the truth and hidden scenes. APIs, or “Application Programming Interfaces”, have revolutionized the way that we use web and mobile applications by allowing computer programs to talk to each other. Because of this revolution, software development and innovation has periodically sped-up over the last 10 years and apps get integrated and communicated in an amazing new ways. We use our PCs, laptops, mobile phones and tablets very day to communicate with our friends, family and colleagues. But how do computer programs communicate with each other? Application Programming Interfaces(APIs) are the hidden backbone of our modern world which allow software programs to communicate with one another. Although most of us don’t know it, behind the scenes of every mobile app and website we use is a mesh of computers “talking” to each other through a series of APIs. As you see in figure, every mobile and digital watch make use of APIs to run their native applications by making a request to web server for getting app relevant data. And web server will send a response of that request via API response. So it makes each mobile app works smoothly without getting heavy. Today, the “API economy” is quickly changing how the world interacts. Everything from photo sharing, to online shopping, to hire a cab is happening through APIs. Because of APIs, technical innovation is happening at a faster pace than ever. If you already write software, you are probably familiar with APIs. 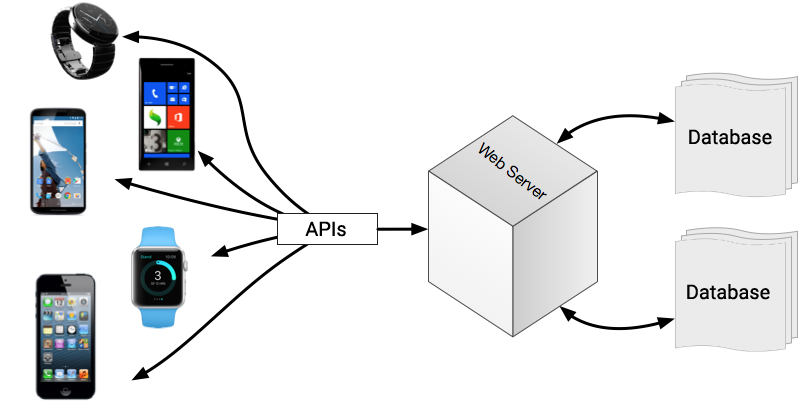 But the rest of you may be wondering: what exactly are APIs and why are they so important? 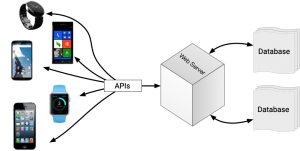 Michael Bock has said in its blog that at the most basic level, an API is a set of rules that dictate how one application communicates with another. APIs aren’t that new either; as written in “What APIs are and Why they`re Important”, APIs were just a way of building applications for a desktop operating system like Microsoft Windows. But in the age of the internet, they have the power to plug applications into, well, almost anything. They’ve already transformed websites like Google and Facebook and Twitter into services that talk to a world of other applications, across PCs as well as mobile phones. But that’s small potatoes. They’re also breathing new life into old-world operations, including mobile carriers and even auto makers. APIs do all this by “exposing” some of a program’s internal functions to the outside world in a limited fashion. That makes it possible for applications to share data and take actions on one another’s behalf without requiring developers to share all of their software’s code. Sharing code at that scale would be massively inefficient in addition to posing major security threats. APIs allow for this type of integration without sharing the actual code that makes the software run. APIs are useful even for open-source software (where the code is freely and publicly available): most developers don’t have the time or patience to look through thousands of lines of code just to use one piece of functionality. Instead, that functionality can be offered through an API. Without APIs, applications would be incredibly disconnected and therefore confusing. APIs allow applications to talk to each other and for more innovative and consistent applications to get built. Imagine, for example, if Google Maps didn’t offer an API: every mobile application and website on the internet would have to figure out how to implement their own mapping system from scratch, an incredibly difficult task. APIs can also be useful internally for a company in addition to sharing resources across companies. Instead of having to duplicate code for each of other apps, they can share data via one API. APIs simplify much of the complexity of software development by limiting outside access to a specific subset of functionality — usually data exchange. Because of this, new software can often be built in weeks instead of months or years. We see APIs like this all the time. Elsewhere on page you may see the icons to share anything on Facebook, Google+, Twitter, LinkedIn or Youtube. These are just links that call on the APIs associated with each of those services to allow users to Tweet or post about the thing you want to share without leaving the site itself. Mobile devices like iOS and Android phones and tablets have many built-in APIs. For example, Apple recently announced a new API called “HealthKit” as part of iOS 8 that allows developers to access a user’s health data from a a central place. A major issue with APIs is that they aren’t necessarily permanent. Just because a company is making an API available now doesn’t necessarily mean it will be available tomorrow. Twitter infamously limited third-party access to its API at the end of 2012. This had the effect of killing all alternative Twitter clients and forcing users to use Twitter’s official apps and website, where Twitter can show users ads as it pleases. This was done under the guise of providing a more cohesive user experience, but for many developers who relied on the Twitter API, it meant shutting down their business because of Twitter’s decision. Other examples of this API abandonment are common. Startups that provide an API often shut down or get acquired, and Google is notorious for closing down services that people rely on like Google Reader (that allowed people to aggregate all the news services they read into one place). Since web APIs are still in their infancy, there is still a lot to learn. One of the things API providers should understand is that an API is a promise: once other people are relying on it, it is crucial maintain it and keep it active. The good news is that for the most part, APIs encourage innovation and don’t stifle it. Without APIs, communication between apps would be stifled, software developers would continuously be re-writing software that performed the same functionality, and generally innovation would slow. APIs have allowed for more trivial things like sharing photos with friends, but also for the potential to re-imagine government. As the world moves further and further into the technical revolution, APIs will have an even bigger role powering the apps and websites we use every day.